Learn everything you need to know about your 18 month old toddler. Track important developments and milestones such as talking, walking, growth, memory & more. "Look What I Can Do Now!" A little toddler loves to try big girl things! Watch as she imitates you talking on the phone, preparing dinner, or sweeping the floor. Your adorable copycat is sharpening her communication and social skills; if she's mimicking an older child, she might be testing her physical and cognitive abilities too. Give your tot simple chores such as sorting socks (can she pick out all the white ones?) or carrying napkins to the dinner table. She'll love the sense of accomplishment and responsibility. Enjoy her cooperative spirit now -- chores are sure to be met with heavy sighs and eye rolls before you know it! 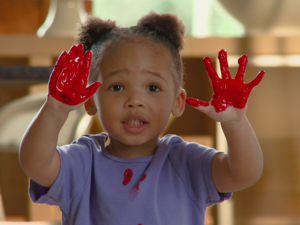 Play is another terrific use of a toddler's seemingly endless supply of energy. Put her improving hand-eye coordination and motor skills to the test by encouraging her to build a short block tower, feed herself with a spoon, finger-paint a picture, or roll a ball to you. Her large motor skills also continue to develop. Your little one might be running (albeit haphazardly) and even able to walk backward now. For fun, turn your living room floor into a toddler disco: With some zippy tunes and space to move, a toddler can dance up a storm as she bounces up and down and waves her arms around. She might even like to clap along (though not necessarily to the beat) or shake a tambourine to the music. How cute is that? 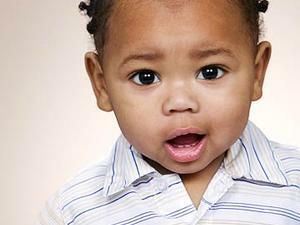 While your kiddo's motor skills steadily change, her verbal skills might be taking off. She probably wants you to name everything now, as she adds new words to her vocabulary each day. Toddlers love repetition of fun songs, finger plays, games, and reading books to help them learn. Read a story about farm animals and see if your kiddo can moo, cluck, and oink! Toddlers' small stomachs fill up quickly at mealtime, meaning they need snacks throughout the day to keep grumbling tummies at bay and help satisfy their bodies' nutritional requirements. When you think of snacks, what comes to mind? Chips, cookies, maybe ice cream? When it comes to between-meal nourishment for your tot, it's best to consider snacks as mini meals -- well-rounded bites that offer a boost of nutrition as part of an overall healthy meal plan. A good snack often includes some protein and carbohydrates. If you find you're serving a lot of prepackaged, convenient junk food to your family, take a few minutes to write down ideas for healthy snacks, then post it on your refrigerator to trigger your memory. A few simple suggestions for toddlers include cottage cheese or yogurt with fruit, whole grain crackers or pretzels with a sliver of low-fat cheese, low-sugar cereals, unsweetened applesauce, and of course fresh fruits and vegetables sliced into manageable pieces for little hands. Do you let your kiddo watch TV while she's munching on her fruit? Too much screen time (or even any, according to some experts) isn't good for your toddler, and some studies have linked television watching in early childhood with obesity, ADD, and aggressiveness in young kids. The experts also agree that children under age 2 are too young to benefit from educational programs and will learn from interactive, hands-on activities and exploring -- and of course time spent with you and other attentive people. If you choose to allow your little one a short amount of time in front of the tube, experts recommend choosing an age-appropriate, commercial-free program. Moms Need to Sleep Too! Is a good night of sleep eluding you? Sleep deprivation isn't just for parents of newborns; many women find themselves caught in a cycle of restless nights and hazy days. Inadequate sleep not only makes us tired (and sometimes cranky!) but can lead to impatience, poor decision-making, even depression and illness. What's an exhausted mom to do? Start by taking a look at your nighttime habits. When your toddler is rubbing her eyes, you give her a warm bath, dress her in comfy pajamas, and read her a story before tucking her in with a good-night kiss. Moms know that consistent bedtime routines are super helpful in getting kids to sleep. Now consider that using external cues can also help you get more, better quality Zs. Determine what bedtime works best for you and give yourself a chance to unwind. Watching TV, surfing the Web, drinking coffee or alcohol, or getting in a late workout all prohibit restful sleep. Instead, try sipping a cup of caffeine-free herbal tea, reading a book, listening to music, praying, or meditating. If you find your mind whirling with thoughts, jot them down in a journal so you won't worry about forgetting something important. Check your surroundings: Is your bedroom clean and inviting? Is the temperature cool enough? Is your bed comfortable? Think about what calms you and add these elements to your sleeping area. Lastly, make the most of your time. When your baby was born, you likely heard the old adage "sleep while the baby sleeps," and that still holds true today if you're wiped out from inadequate rest. Go ahead and indulge in a daytime nap while your little one is in her crib. If you're not well, get a friend to watch your child while you catch a much-needed snooze. 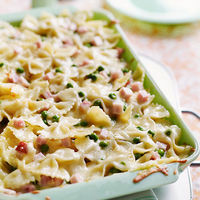 Try these 20 kid-friendly casseroles for a no-fuss meal.